ROBIN JONES GUNN is the best-selling Christian author of 90 books, including several series aimed at teen girls, the widely popular Christy Miller series, as well as Christian fiction for adult women and several non-fiction books. Her books have sold over 4 million copies worldwide. She makes her home in Hawaii. "Robin has an ability like no other to write a story that not only captures your attention but your heart. 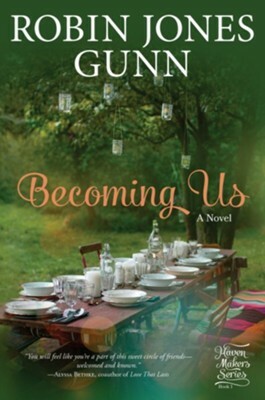 Thats exactly what shes done yet again with this must-read, Becoming Us!" "Robin beautifully tells a story of friends who walk through the realities of life: motherhood, singleness, infertility, friendship, moving, what it looks like to support and follow your husband, celebrating lifes joys, and understanding one anothers sorrows. You will feel like youre part of this sweet circle of friendswelcomed and known." "In her classic voice, Robin Jones Gunn draws us into a story of family and friendship, of courage and spirit. Becoming Us is a heartwarming story that will stay with you long after the final word." "Becoming Us is a sweet and beautiful tale of letting go and letting God. The characters made me, a young mom myself, feel surrounded by a group of treasured friends, as they welcomed me into the haven they created." "A heartfelt story of the power of faith and love, Becoming Us is hard to put down. Once again, Robin Jones Gunn has created believable characters who struggle with everyday problems and emotions that we all face. Her ability to weave beauty and hope into the complicated life of Emily Winslow and her newfound friendships, a delightful circle of women, renewed my faith in Gods good plans for my own life and relationships. A must-read!" I'm the author/artist and I want to review Becoming Us: A Gather Novel - eBook.